Find out how you can help yourself overcome food addiction and beat cravings. If you find yourself constantly battling with food cravings you may be experiencing an addiction to food. Some experts believe the effect food has on our brains (especially sugary foods) can make food addictive. This is because our brain’s pleasure centres light up when we enjoy a tasty treat and the brain becomes hard-wired to seek out the pleasure again. Because the foods that light up our pleasure centres are typically high in fat and/or sugar, this can turn into an unhealthy habit. 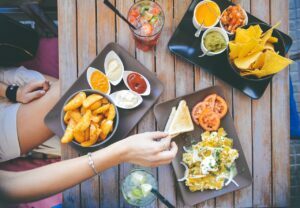 Below we look into some strategies you can try to overcome food cravings and beat food addiction – for good. When you eat high sugar food your blood sugar spikes and then crashes, causing cravings to kick in. Keeping your blood sugar levels on an even keel will help you avoid crashes and cravings. The best way to do this is to avoid foods that cause a spike in blood sugar levels, opt for slow-release foods that gradually release energy instead. For many people, the only way to avoid cravings is to eliminate the food they’re craving completely. You may experience some side-effects to begin with, such as headaches, but over time you should stop craving the food you’ve eliminated and the benefits will be more than worth it. Eating a well-balanced diet will ensure you’re getting all the nutrients you need while helping you stay full up and less likely to cave into cravings. Try to ensure your meals contain: protein (fish, lean poultry or nuts), good fats (olive oil, nuts, seeds or avocado) and carbohydrates (vegetables, fruit or whole grains). High stress levels can trigger the hormones that activate cravings. Introduce stress-relieving techniques into your daily routine – this could be meditation, deep-breathing exercises or self-hypnosis. Exercise can help control your appetite, making you less likely to be tempted by cravings. Find an exercise that you enjoy and that fits into your life so you will be more likely to keep it up. Not getting enough sleep has been shown to affect appetite hormones. Start winding down about an hour before bed and address any sleeping disorders you may have. Many people find it helpful to speak to a professional about their cravings. Find out how a hypnotherapist could help you overcome food addiction.